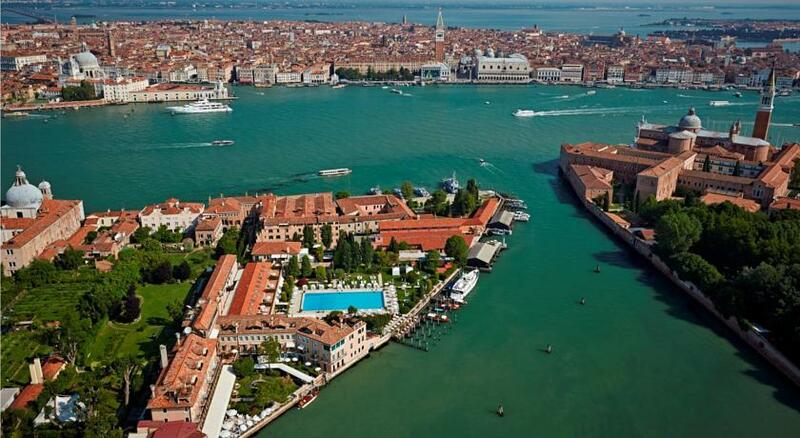 Venice has been charming wealthy visitors for many years, and the city boasts a good number of luxury hotels. There can be few better places to indulge yourself (or a loved one) with some five-star treatment. If you're going to splash out, Venice is the place to do it, and you might as well splash out in style. Arrive in a water taxi along the Grand Canal, sleep in a luxurious four-poster bed in a fourteenth-century palace, dine on a terrace where illustrious historical figures have feasted ... . 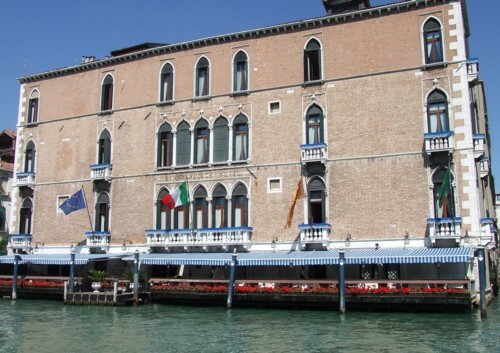 Some of Venice's five-star hotels have been grand hotels for a very long time, and they are proud of their history. Occasionally it may feel as though they are trading on this rather too much: if you prefer a thoroughly modern approach to comfort and style, you could try one of the newer options where luxury is combined with a more contemporary approach. You should be able to expect international slickness at these hotels, with only the occasionally Italian faltering (issues with internet access, for example). Rather curiously, the smart hotels in Venice often quote prices for the room only, leaving breakfast as a very expensive extra (check when booking). Mini-bars and room-service are also very expensive. Our general page about hotels in Italy gives more information of what to expect; even at five-star level guests from the New World tend to find rooms small and gloomy (typical of historic urban buildings such as those in Venice). Read other guests' reviews to see if you will be happy paying the high prices of these properties. 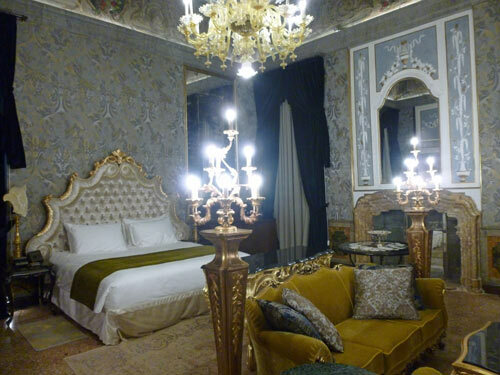 The cost of a five-star in Venice varies considerably by establishment and by time of year. While the grandest of the hotels charge stratospheric prices, others in the list below have more attainable room rates - the kind of price that's only a bit of a stretch beyond a four-star. If you fancy a taste of luxury, but find the cost extortionate, you could consider what I sometimes do: treat yourself to one or two nights in a posh-but-just-about-affordable five-star hotel, then move to a cheap hotel or B&B nearby for the rest of your stay. If none of this selection suit you, consider looking at hotels with a lower star rating. Some of Venice's four-stars are extremely comfortable, and among the town's three- and four-star hotels you'll find some very special smaller places to stay, with lots of character and charm. Romantic, intimate, stylish and very special, this boutique design hotel has just twelve rooms and is situated in a lovely spot by the Salute Church and the Grand Canal. I stayed here and thought it was just about the best - and most luxurious - hotel I've visited. One of the newest five-star hotels in Venice, Palazzo Venart opened in 2016 in the historic Palazzo Bacchini delle Palme, looking over the Grand Canal close to San Stae church and vaporetto stop. Restored sympathetically, it now combines features of a fine Venetian palace (original wall-paintings, terrazzo flooring, chandeliers) with those of a luxurious modern hotel. I've looked around and was impressed with the historic atmosphere and with the garden on the Grand Canal. 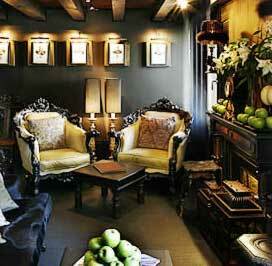 The eighteen rooms and suites vary from modern to grand ducal in style. 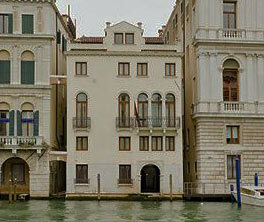 Probably the most famous hotel in Venice, the Gritti Palace is a historic landmark in itself. I asked a Venetian friend which of his town's hotels he would choose to stay in and he didn't hesitate: "the Gritti". According to Ernest Hemingway this was,'the best hotel in a city of great hotels'. Another palace that once belonged to a doge, the Gritti Palace is now an elegant five-star luxury hotel on the Grand Canal. Some rooms look over the Grand Canal, and views can also be enjoyed from the waterside terrace. Only a few years old, this discreetly exclusive hotel is in a romantic 14th-century palace, with a terrace over the water for classy dining. The only drawback is the proximity to the landing stage of the Ca' d'Oro vaporetto stop, which could cause some noise. The central location is useful for sightseeing and for travel, though the lanes nearby are busy ones. Offering a very different experience to Venice's other deluxe hotels, the San Clemente Palace is actually on its own island in the Venetian lagoon. Previously the island housed a monastery and then a lunatic asylum, which may add a piquant note to your luxury stay. There is more space and there are more 'resort' facilities than in Venice's city hotels, with a swimming pool, gardens, spa and sports facilities. The hotel's boat service takes guests to and from Venice, ten minutes away. The Londra Palace has been a favourite of visitors for many years. Its setting on the Riva degli Schiavoni waterfront gives the hotel good lagoon views and is convenient for St Mark's, though the waterfront outside is very busy with tourist crowds. It's not as 'special' as some of the other hotels listed here, but it is a reliable and popular place to stay, with excellent reviews from past guests. Along with the Gritti Palace, the Cipriani is one of the very top hotels in Venice - and Italy. Repeat visitors include the rich, the famous and the very discreet. The hotel is situated with its own very private grounds at the tip of the Giudecca island, across the water from St Mark's and the Ducal Palace. Tucked away in a location just beyond St Mark's Square, this large five-star is also close to the Grand Canal, Harry's Bar and some of Venice's most expensive designer clothes stores. 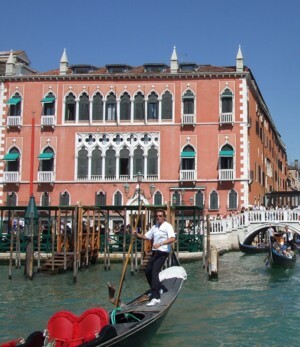 Ideal if you want a quick sightseeing break in the tourist heart of Venice, with the hotel as a luxurious retreat from the hubbub of the lanes and waterways. 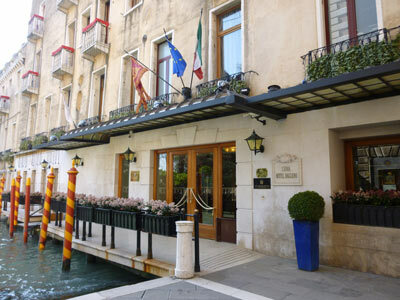 The hotel has a private jetty for arrivals by water taxi; it's also very close to the San Marco waterbus stop. 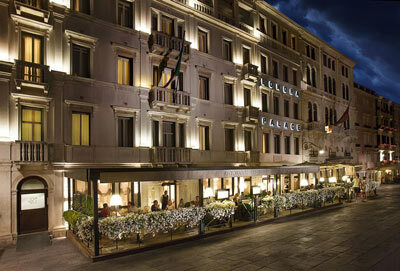 The Danieli is one of the most famous and long-established hotels in Venice. Built in the fourteenth century, the palazzo belonged to the family of the remarkable doge, Enrico Dandolo. It's been a hotel since 1822, and sits overlooking the lagoon past the end of the Grand Canal, opposite the island of San Giorgio Maggiore. John Ruskin stayed in 1835, arriving during acqua alta: "The beginning of everything was in seeing the gondola-beak coming actually inside the door at Danieli's, when the tide was up, and the water two feet deep at the foot of the stairs." The hotel's location has good and bad sides - it's a perfect location for a first-time sightseeing trip, but a negative point is the crowded Riva degli Schiavoni outside; Venice's busiest stretch of pavement. Another is the hotel's modern annexe, which doesn't have the same character as the grand main building. 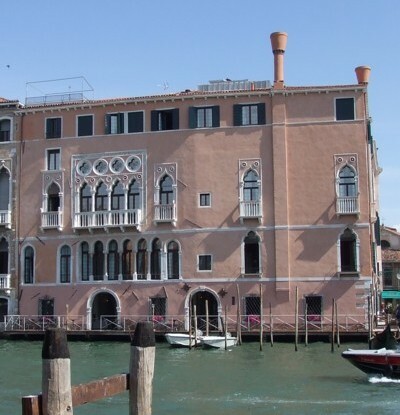 Palazzina G is a newish five-star hotel in a small historic palazzo on the Grand Canal, next to the contemporary art gallery at Palazzo Grassi. With interiors designed by Philippe Starck, the hotel is strikingly contemporary in style - it's probably best for visitors to check the photos to see if the look is to their tastes. The Excelsior is on the Lido, between the Venetian lagoon and the Adriatic sea. The building is grand and fantastical; overlooking the sea in fake Moorish-Venetian splendour. It's located right next to the headquarters of the Venice Film Festival and hosts glamorous guests and events during the festival at the end of August/beginning of September. There's a boat shuttle to Venice. As befitting an old-fashioned grand sea-bathing establishment, the Excelsior closes for the winter (October-April). 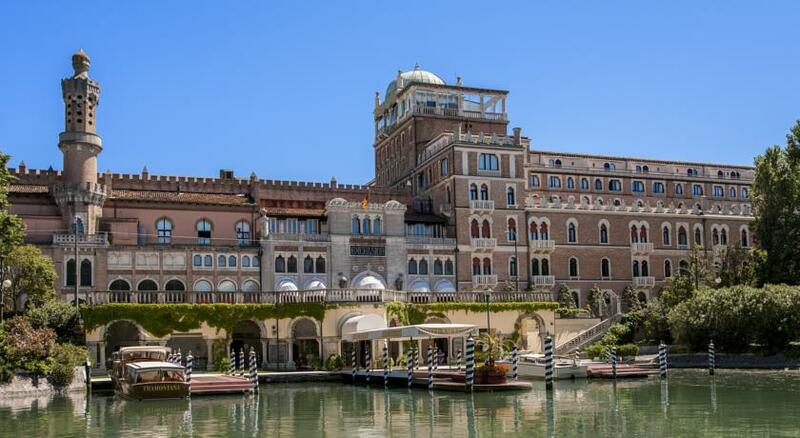 Other five-star hotels include the JW Marriott Venice Resort and Spa, which, like the San Clemente Palace, is on its own island just south of Venice. 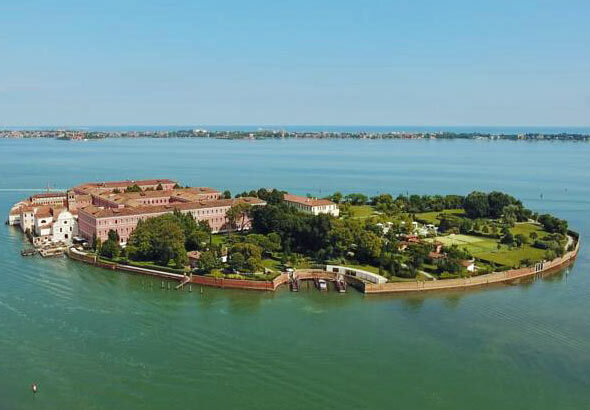 The Bauer Palladio Hotel & Spa is based in a converted convent with a garden on the island of the Giudecca. On the northern shore of Venice, away from the busy hotel areas is the Boscolo Venezia, with a pretty entrance on a small and picturesque canal, and a lovely large garden which extends to the lagoon shore.